I can’t say I really know how easy other nature photographers have it, though I imagine they face many of the same frustrations I do. I need to say here that I’ve always held a full-time job not related to photography, because, bluntly, I need to pay bills! So my nature photography takes place on the side, when I can arrange the time to do it. It doesn’t help that where I live presently is not as rich in subjects as other places I’ve lived (like Florida), so making a decent weekend of shooting often requires traveling somewhere else. (Of course, one of the things I emphasize in my nature photography talk is finding subjects anywhere you are, so I’m contradicting myself here. The truth is, you really can find subjects anywhere, but some places are much easier than others). So, what about my buddy to the right, here? What’s his story? 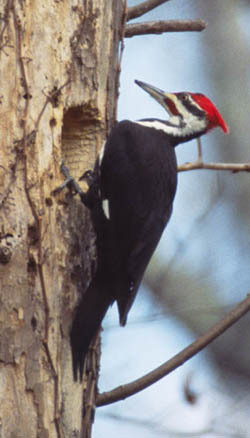 This is a Pileated Woodpecker, the biggest woodpecker species in North America – unless, of course, it turns out the Ivory-billed Woodpecker is still extant, something that’s in debate right now. These guys are a bit more common though, but still fun to watch. This particular one was taken practically right outside the door where I work. 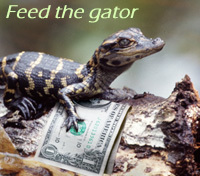 And that opening in front of him isn’t for food – he’s making a nest. I don’t get opportunities like this too often. It’s one thing to stalk through the woods at a key time in the year, listening for bird calls, until you locate a nest in construction, then find a prime location, set up a blind, and spend a lot of time staking out the nest so you can catch nice, detailed shots of behavior and plumage and, most especially, the young being fed and venturing out for the first time. These kinds of shots can take a lot of effort. However, it’s another thing to have a woodpecker, who doesn’t mind relatively close approaches, creating a nest right alongside where you have to be every day anyway. And since I work for a wildlife organization, finding the excuse to walk outside routinely isn’t that hard. When I got this pic (admittedly a tad softer than I like), I was psyched. I was looking forward to a whole series of shots that I’ve never been able to devote the time to before. Alas, it was not to be. The key part of all this was this male finding a mate to go along with the nest, which never happened. Part of this was probably due to another male in overlapping territory, which resulted in a few disputes. Another part may have been that I never once spotted a female in the area. Eventually, however, the nest was abandoned unfinished, and I only saw this male on occasion after that. Some years back, when I had way too much time on my hands, I was active on several newsgroups. Among these were three devoted to UFOs and paranormal activity. I had grown up in the UFO subculture, believed a lot of it (along with Bigfoot, Nessie, and much of Chariots of the Gods? ), but with adulthood and the input of various sources I had found many logical difficulties with all of them. My presence on the newsgroups at that time was, as now, from a critical-thinking standpoint, and because I was exercising my photographic knowledge with evaluating the evidence photos. With such subjects, there are two distinct sides, which I’ll just call Believers and Skeptics for now. These sides, while not necessarily distinct for everyone, nonetheless led to something akin to sports rivalry, and no small amount of pointless sniping back and forth. Which leads to this. I wrote the list below in direct response to a similar post against skeptics. Yes, it’s intended to be an exceedingly broad generalization, and more than a little tongue-in-cheek. But it’s also wry commentary on the types of arguments that tend to come up in such discussions. So, I didn’t go out to shoot anything new to kick off the International Year of Astronomy like I should’ve, when we had nice clear skies (but cold, of course). So instead, I’ll post a curious photo and ask for comments. The pic above was taken in 2007, my best guess is August 13th or 14th, round about midnight EDT. I had set up my EOS 3 with the intervalometer to do a multiple exposure of the night sky. Unfortunately, since this was just an experiment, I didn’t write anything down, so the specs I’m about to provide are in question, and if you have reason not to believe them, then go with your instincts. 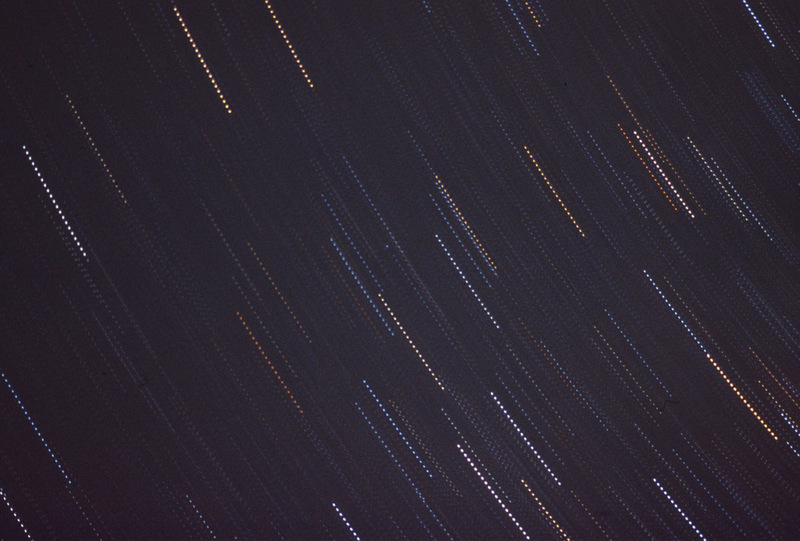 Anyway, I believe I ran a series of exposures of 8 or 10 seconds each, 45 seconds apart. I was aimed nearly straight up, and shooting with my 24-135mm lens at, most likely, 24mm (since the zoom would have crept down to that setting anyway with being aimed upwards), which would give this frame a (roughly) 72 degree field of view along the long side. There’s a chance I used the 105mm macro (19 degrees), but doubtful – I think I was using that on another body at the same time. The film is Fuji Provia 100F slide film, because, hey, nothing else brings out the star colors half as well. My position was roughly Lat 36.020° N, Lon 79.131° W.
While am I going into all this? Because, right dead center of the frame, is something I don’t think should be there. Look for the blue dot that’s a little brighter, and extended off the tip of, a trail in the middle of the frame. You can click on the pic above to see the larger version, and I can provide a full-frame scan upon request of anyone who really wants to play around. No, it’s not an extension of the trail it’s near, with the separation occurring because of clouds – there were none that night. No, it’s not a plane or satellite, since both would have left trails at that exposure length. Same goes for a meteor (and yes, this was during the Perseids storm), unless it came right straight down towards the camera. So, any ideas? I toyed with the idea of it being a rare visible Gamma Ray Burst, but there’s no record of one occurring during that timeframe. And nothing else has come to mind. 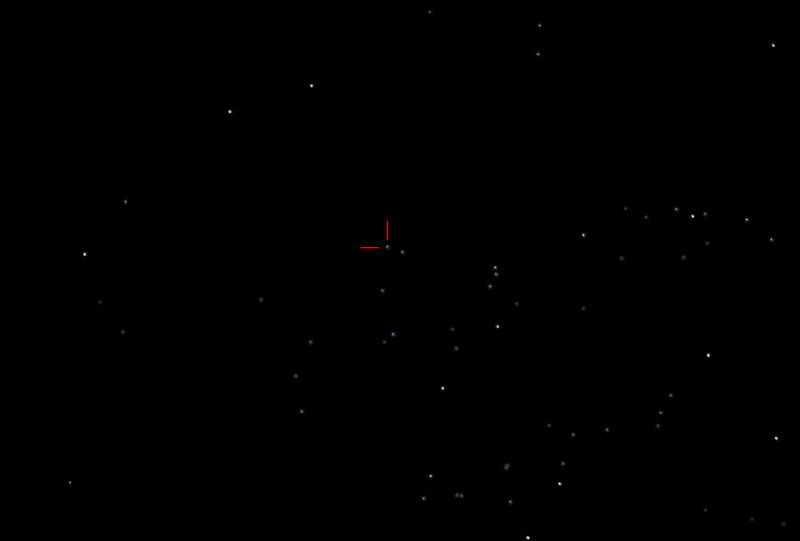 Now, I have no idea what constellation or area of the sky this is in – I honestly do not recall where I was aiming, and perusing sky charts for that time has not yielded any matches yet. Oh, yeah, I should probably mention that I did a Photoshop trick on another version, filtering out all but the end point of each trail to produce a proper starfield. If you download that pic, please keep in mind that I have no idea when that stray dot occurred during the series of exposures, so its position could be anywhere along a diagonal line stretching down and to the right of where it’s marked. In other words, I choose one out of 21 different positions to plot the individual stars, but do not know when the stray dot appeared during those 21 exposures, so don’t consider it accurate in relation to the other stars. It’s even possible it’s a booger in the film emulsion, but it seems like a stretch to have one that’s the same size, shape, and just a little brighter than the objects in the rest of the frame. I stumbled on another possibility that I’m favoring right now: I caught a geostationary satellite. 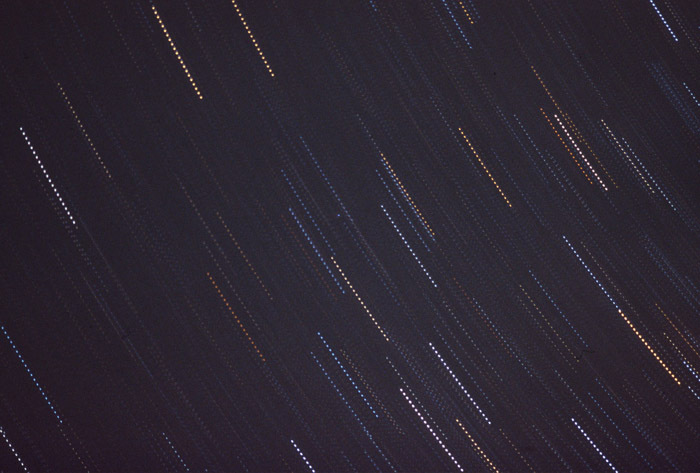 A long exposure posted on, I think, the Earth Science Picture of the Day site (whose archives are unavailable as I type this) showed several points of light among the streaks of an extremely long star exposure, identified as geostationary satellites. They would in the same area of sky no matter what the time or season, hence the name. Internally, I argued that the lateness of the hour when I took the photo would have precluded any satellites being illuminated by the sun, but geosats are way the hell out there, intended to link as much of the globe as possible, so they stand a good chance of being constantly illuminated. Their distance would also make them faint, but my photo is, essentially, 21 exposures, and for something stationary that would mean they’d all pile atop one another to add to the exposure of that point. Anyone who can shed some light on this (oh my, I’m such a card) is welcome to chime in. A few days back, Rev. BigDumbChimp (gotta love that name) linked to an article on another blog concerning the origins of christmas. All well and good, and most of it I’d heard before. I didn’t follow the sources that were linked, but I’m pretty sure the Coca Cola bit is spurious, so I have reason to wonder about the other content. However, the overall provenance of the holiday is supported through numerous sources, and it’s far from the story we’re usually fed. Yes, it was clearly co-opted from quite a few other observances and traditions that existed previously, and no, it can not by any stretch be considered the day of jesus’ birth. While I’m not religious and see no reason to support any claims of such, I still feel compelled to say, “So what?” When it comes right down to it, we can call into question every particular day we celebrate a holiday (July 4, for example), and the number of times our calendar has bounced around and been rewritten makes everything older than a few hundred years highly suspect. It’s not the accuracy of the day that we respond to, but the sentiment behind it. • Christmas celebrates the birth of the Christian god who came to rescue mankind from the “curse of the Torah.” It is a 24-hour declaration that Judaism is no longer valid. • Christmas is a lie. There is no Christian church with a tradition that Jesus was really born on December 25th. • December 25 is a day on which Jews have been shamed, tortured, and murdered. • Many of the most popular Christmas customs – including Christmas trees, mistletoe, Christmas presents, and Santa Claus – are modern incarnations of the most depraved pagan rituals ever practiced on earth. In other words, shame on us all for celebrating the holiday with Hot Wheels in our stockings. One, If you really want to keep the fires stoked over the “War on christmas,” there’s probably no better way to do it. The whole “war” thing has been this asinine crisschin whinefest because someone dares to recognize that not everyone in the world follows their religion, and yet we still want to send people holiday wishes anyway. I always thought “Happy holidays!” was a measure of respect for everyone – peace on earth, goodwill towards men, and stuff like that? I guess I’d be a better person if I was more selfish and insular about my beliefs – at least that seems to be the message. But Kelemen’s article is just the kind of ammo the martyr crowd needs to keep the “War on christmas” frothing going. And (as I’ll get to in a minute), for no good reason. Two, I’m afraid I’m disinclined to hold anyone responsible for the origins of a holiday that they know nothing about. “Hi, little girl, did you know your letter to Santa asking for a toy pony was really a celebration of persecution and genocide? You should be ashamed of yourself!” No, sorry, that’s a ridiculous argument worthy of small minds, and I’m inclined to say it’s hypocritical, in that it tries to produce a prejudice where none exists. And finally, the heart of the matter. Yes, it may well be true that the origins of the holiday were once bathed in reprehensible practices. Go far enough back, and be selective enough about virtually any tradition, and I’m sure you can find something unsavory. There’s a distinct and valid point that’s missed with all of this, though, and it is: We don’t do that anymore. We have risen above it. We, as a species, have recognized that many, many things in our past were immoral, unethical, and generally not conducive to good relations with one another, and we stopped doing them. We still have a ways to go, in many aspects of our cultures throughout the world, but that doesn’t negate what we’ve already accomplished. And more importantly, we take a step backwards when we choose to target some past behavior and try to relate it to our current culture – it is creating a bias, an opposing side, an enemy, that does not belong. That’s not progress. We celebrate christmas now with family get-togethers, good food, and gift-giving – an overall atmosphere of friendliness, generosity, and bonhomie. That we’ve produced this from past practices of bigotry and persecution is something we should actually be proud of – not that they occurred in the first place, but that we have abandoned them to focus on something much more positive. We should not be held accountable to our past – just our present. Make it a good one.